If you jump back to Ina Garten’s Guacamole post, you’ll see I’ve been having some issues. Today I can move my right hand around a bit, but it’s still pretty painful, but the swelling has gone down quite a bit, the cortisone shot seems to be helping my shoulder & my new ankle brace is letting me get around better. So expect a few more random posts until I can get into some good, traditional (to the Midwest U. S. anyway) holiday cooking. But random or not, Ina Garten’s Salmon & Guacamole Sandwiches are a must make any time of the year! Until I tried Ina Garten’s Salmon & Guacamole Sandwiches I have never really had the experience of salmon and avocado together. (I know it’s not a “new” idea but I don’t usually buy or eat a lot of pricey salmon, more on that, below.) I can hardly describe what a magical alchemy the flavors are together. The avocado and guac with all that lime and crispy, salty bacon just meld together into such a pleasing flavor and the textures are amazing, too. While the salmon and guac are softer, that crispy, crunchy bacon adds so much dimension. Ina shows her Ina Garten’s Salmon & Guacamole Sandwiches on ciabatta, and I think the filling would be great on focaccia, too, but I have to admit the croissants I made my sandwiches with were pretty darned amazing. There’s something about serving sandwiches on a croissant that makes it feel a bit special, especially around the holidays. They’d be great for a lady’s lunch or a shower, too, by the way, but if you serve them up with chips or hearty fries, I don’t think guys would mind a sandwich or two. I think my Stupid Simple Sweet Potato Fries would be perfect, btw. Even if they are on chi chi croissants. I didn’t change up Ina’s recipe much but I did want to zhoosh up the salmon just a bit. I sprinkled it with a touch of cayenne along with the salt and pepper; just a good pinch sprinkled over the fillets. Ina used 4 six-ounce salmon fillets which is a good healthy portion for a dinner, let alone a sandwich. I divided less salmon among the sandwiches. That’s up to you, though. Since the bacon in this recipe is cooked on a sheet tray (See my post on Buffet Style Oven Bacon for more info) I didn’t want to dirty up another pan just to cook the salmon as the original recipe directs – I just cook the salmon right on the sheet tray. Besides, baking or roasting your salmon is so easy and foolproof. The salmon won’t need quite as much time in the oven as the bacon, especially if you use scrappier bits of salmon like I did. Add it in after giving the bacon a head start and watch it closely. The added advantage is that adding your salmon to a good, hot sheet tray is going to give you great flavor on the salmon without overcooking it. And that’s all without pan frying and dirtying up another pan. The disadvantage is that towards the end of the cooking time, you’ll need to watch the salmon and the bacon closely and may need to remove one or the other ahead of time. That’s one of the reasons why I add an extra piece of foil to the sheet pan just for the salmon. The other is to keep the bacon grease contained in the bacon area so it won’t flood your salmon. Salmon can be hard to shop for and just FYI, sometimes what’s labeled “fresh” salmon in your area may have been frozen. Yep. Just like turkey or chicken, ground beef and many sausages, fresh does not necessarily mean what you and I think of as fresh. Fresh means it hasn’t been frozen to a temperature that is below one degree of 27 degrees F. Confused at that wording? I was, too. It turns out that means they shoot for the 27 degrees but there may be a little variance and by law and regulation, that variance is not more than one degree. Strange, huh? You’ll usually find low prices on salmon and other fish and seafood twice during the year, during both Lent and Advent. That means before Easter and prior to Christmas. (The Advent sales are often extending up to New Year’s.) If you’re not Christian, and maybe even if you are, you might not be aware of those cycles. For instance, this week the store has salmon on sale for $5.99 a pound, the lowest I’ve seen all year except for the Lent special I talk about in the next paragraph. The first day of Advent is December 2nd, within this week’s store cycle, so that explains that price. They’ll likely be sporadic sales other times of the year but generally, they aren’t as good. Know your highs and lows and what your expectations are as far a the type of salmon you like to use. Sometimes sales can take an unexpected turn, and you’ll find special offerings, especially during Lent, like this one: The Wild Caught Atlantic photo above, came in a box, sight unseen, 22 pounds if memory serves and was $2.89 a pound. My tradeoff was the salmon, when I opened it was oddly shaped pieces, from the tail end along with small filets. That’s why I went searching for recipes that can be made with pieces of salmon and came across the recipe for Ina Garten’s Salmon & Guacamole Sandwiches. On the plus side, all came in cryovac packages and keep well in the freezer. The nicer filets I can cook as an entree, the odds and ends work well for recipes like this. Sometimes if your store has a great sale and you catch the manager early enough in the week, they can order a larger quantity of the special for you to pick up. Line a sheet pan with foil for easy cleanup. Lay bacon on foil, all on one end, leaving a space on the far end for the salmon. Add a second piece of foil on the clear side, large enough to place your salmon on, turning the edges of the foil up a bit so the bacon grease will not enter. Place the sheet tray in cold oven. Turn oven on to 400 degrees F.
Roast bacon for about 20 to 25 minutes total until browned, but in the meantime, prepare the salmon, below. When the bacon has been in the oven for about 15 minutes, if your salmon is thick, add the salmon to its little sheet of foil. If your salmon is thinner, add in at about 20 minutes. Watch carefully, both the salmon and the bacon, and be prepared to remove one or the other as soon as they are done. To prepare the salmon, pat the salmon fillets dry with paper towels, brush them all over — top and bottom — with olive oil, and sprinkle generously with salt and pepper and a pinch of cayenne. When bacon is done, place on a paper-lined towel plate. When the salmon is done, set salmon aside to rest for several minutes, then break or cut salmon up into suitable bite-sized chunks. If desired, cut the rolls in half crosswise, place them cut side up on a sheet pan, and toast in the oven for 5 to 10 minutes, after removing the salmon and bacon, until lightly toasted. 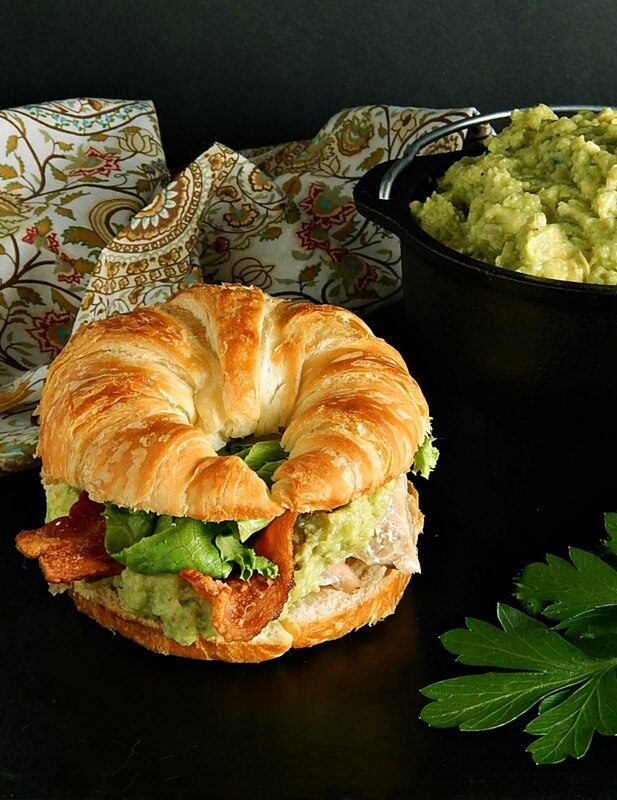 To assemble the sandwiches, place the bottoms of the rolls on a board and spread each with a generous amount of guacamole. Place salmon on top of the guacamole. Add 2 slices of bacon and a handful of arugula or lettuce to each sandwich. Top with bacon. Spread a little more guacamole on the underside of the top bread and place on top. I’ll be sharing Ina Garten’s Salmon & Guacamole Sandwiches at Fiesta Friday #252, and the co-hosts this week are Alex @ Turks Who Eat and Zeba @ Food For The Soul. Stop by and check out Fiesta Friday and Alex and Zeba’s sites; you’ll love them all! This entry was posted in Click here for Bargain Meals, Click here for Fabulous Food Posts and tagged Bacon, Bargain Meal of the Week, Fish and Seafood, guacamole, Ina Garten, leftover fish, leftover Salmon, Salmon, Sandwiches. Bookmark the permalink. Croissants are delicious plain, these are super! You had me at salmon and then at guacamole:) what a lovely combination and love that addition of cayenne to spice things up. Thanks for bringing these lovely sandwiches to the Fiesta party and hope you recover soon Mollie! Mollie, I hope your improving, but take it easy in the mean time girl. Now, as for Ina’s Salmon & Guacamole Sandwiches, you’ve posted one of our favorites. We also make it using cold smoked salmon. Great photos and post. Thanks Ron, getting better every day as long as I don’t overdo it. I bet you have the best salmon there! So sorry to hear about your injury! Hope you’re feeling better soon! In the meantime, these recipes are looking just as delicious as ever! We’re in California and have the luck of avocados year-round, so this will for sure make a lunch debut soon! There are so many times (from September through March, basically) that I’d love to live in California! I stayed in a place there once that had a little courtyard with orange and lemon trees! That was so much fun. A delicious looking sandwich! I hope your hand and ankle get better soon. It’s not fun at all. Thanks Virginia. I can type now with my right hand, just can’t stretch it out for upper case letters. I just better not overdo it. 🙂 I go to a specialist next week. Those types of injuries take their sweet time healing and it gets annoying!